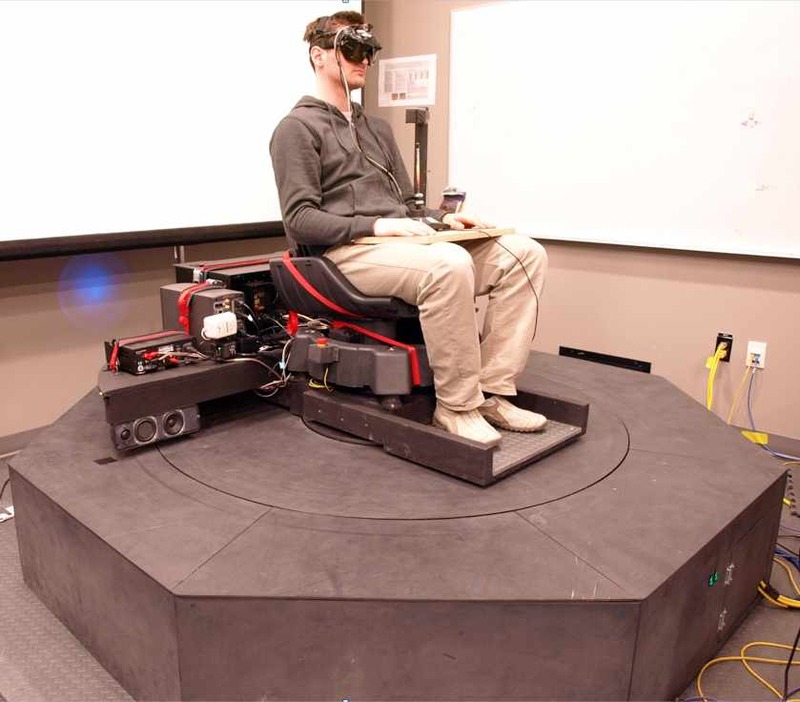 How impor­tant are phys­i­cal motions for effec­tive spa­tial ori­en­ta­tion in VR? Most vir­tual real­ity sim­u­la­tors have a seri­ous flaw: Users tend to get easily lost and dis­ori­ented as they nav­i­gate. According to the pre­vail­ing opin­ion, this is because phys­i­cal motion cues are absolutely required for stay­ing ori­ented while moving. In this study, we inves­ti­gated how phys­i­cal motion cues con­tribute to spa­tial updat­ing in a real­is­tic and highly struc­tured vir­tual envi­ron­ment, using a rapid point-to-origin par­a­digm with­out per­for­mance feedback. After visu­ally dis­played pas­sive move­ments along curved streets, par­tic­i­pants were asked to point back to where they started. In some con­di­tions they phys­i­cally rotated with the curve, in others they only received visual motion cues. Results showed that phys­i­cal motion cues did not affect point­ing error or response time sig­nif­i­cantly. This sug­gests the pos­si­bil­ity that phys­i­cal motion cues might be unnec­es­sary if visu­als are real­is­tic enough. Furthermore, two par­tic­i­pants unex­pect­edly exhib­ited ‘non-turning’ point­ing behav­ior, react­ing as if they had not updated their head­ings during move­ments across all con­di­tions. Implications and follow-up stud­ies are discussed. 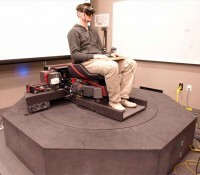 Below is a video of Salvar Sigurdarson’s first ever con­fer­ence talk at the IEEE Virtual Reality con­fer­ence enti­tled “Can phys­i­cal motions pre­vent dis­ori­en­ta­tion in nat­u­ral­is­tic VR?”. And here’s a more recent pre­sen­ta­tion from Bernhard on online spa­tial ori­en­ta­tion study and the rather unex­pected response pat­terns that we observed — and how we might be able to make sense of them. Here’s the ref­er­ence for the talk: Riecke, B. E., Stepanova, E. R., & Kitson, A. 2016. New response pat­terns in point-to-origin tasks depend­ing on stim­u­lus type and response mode. 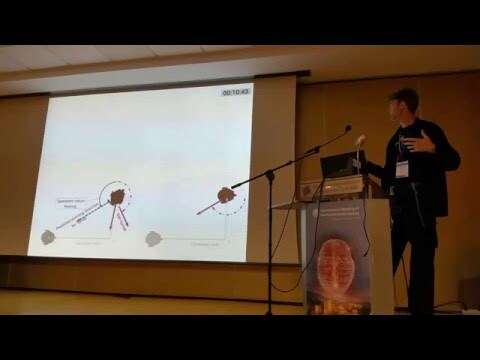 Talk pre­sented at the International Meeting of the Psychonomic Society, Granada, Spain. Which direc­tion is the origin of motion for this visu­ally sim­u­lated loco­mo­tion in Virtual Reality? The below video shows a visu­ally sim­u­lated loco­mo­tion of a 2-segment path in a simple vir­tual envi­ron­ment with­out any land­marks (i.e., just pro­vid­ing “optic flow”). Your point­ing response can reveals whether you are a “Turner” or “NonTurner”, i.e., whether you tend to incor­po­rate the rota­tion into your point­ing response (and thus mental spa­tial rep­re­sen­ta­tion) or not.